A couple of caveats—these observations are only based on my personal limited stay in Beijing and not elsewhere in China and represents a small sample size of observations so certainly wouldn’t be considered statistically valid. Some of the comments may seem naive or obvious, but being my first time there, but to me, were all new experiences. I landed in Beijing on a Sunday afternoon and after arriving at the hotel, had a nice dim sum lunch at Lee Garden, a new restaurant recently opened. Excellent dim sum that I enjoyed more than the dim sum I had the day before in Hong Kong at the East Ocean Restaurant. Being that this Sunday and the following Saturday would be my only free days, I made a quick drive to Tiananmen Square using a local driver and walked into the square for my first tourist experience of China. The adjacent government building right before the entrance to Forbidden City was under some maintenance and green awning covered up much of the building. Spent the week working with the team at the office which was walking distance from the hotel. A good amount of work was completed and often times face to face meetings are simply the best way to really align on priorities and issues of a global team. Each day we had lunch at local restaurants in the food court on the basement level of the office towers. For dinners, I generally went to a local restaurant with members of the team and sampled local seafood, duck, and other cuisine. More on cuisine below. A couple of evenings, I visited nigh-time spots the Kerry Center and San Li Tun Village which were packed with locals and ex-pats. On Friday evening, I spent my only chance to do a little bit of shopping at the Silk Market for an hour or so. Some basic gifts for the family and practice in the art of bargaining were the key outcomes of this experience. After shopping, I went to a variety entertainment show at the Lao she tea house. A very enjoyable program highlighted by the amazing Sichuan face changing routine, exemplary kung fu and acrobatic performances, and traditional Chinese music. Prior to the program, I also enjoyed a musical routine using Chinese instruments and tea cups as a pleasant sounding musical instrument. My last day in Beijing was my real tourist day. On this Saturday, I went to the Forbidden City in the morning, followed by the 2 hour+ drive to Ming’s Tomb and the Great Wall at Badaling, and then culminating with a stop at the Beijing Olympics stadiums in the evening— Bird’s nest and the Water-cube. 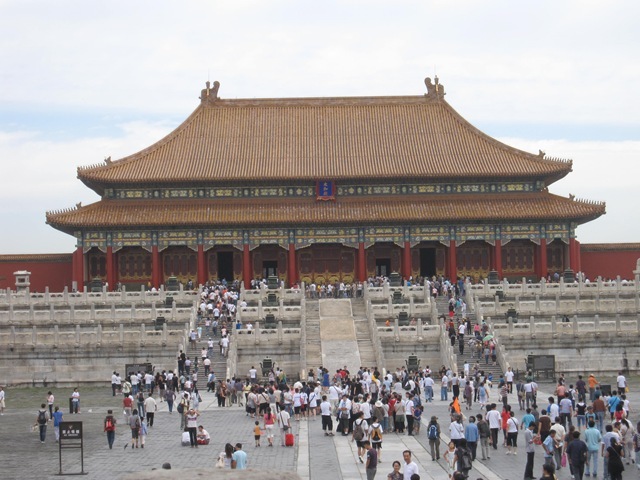 The massiveness and uniformity of the Forbidden City stood out to me. This was also a great place to observe local Chinese residents and Chinese tourists—some of those observations are below. The Great Wall is clearly one of those places you just need to go to if you get the chance and try to comprehend the history,the vastness and importance of the wall. While it made for a long day, I’m very glad that I got the chance to make it there. 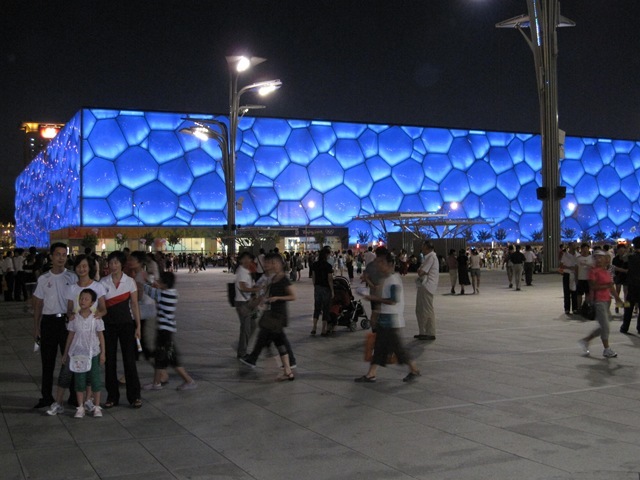 Finally, seeing the Bird’s nest and the Water cube at night served two purposes. First, the stadiums at night all lit up is a beautiful sight and made me feel some of the Olympic spirit that I watched on television. Second, the promenade between the two stadiums also appeared to be a great place for Chinese families and tourists to stroll around, people watch, or experience the nice evening weather by flying kites. Some of my first impressions of Beijing and China centered around pre-conceived notions of what I thought China would be like versus what I really noticed. Most noticeably, the streets seemed less crowded and more organized than I envisioned. Considering its status of the world’s most populous nation, I figured the streets would be full of people, bicycles, and cars everywhere you go, that there would seem to be a sort of organized chaos with people, bicycles, vendors, buses, cars all with their place within this frenzied hierarchy. I, however, did not notice that. The roads seemed organized, not overly crowded, a lot fewer bicycles and people than I anticipated. Of course, there was traffic and crowds, but not like what I’ve seen in India for example. Additionally, given my expectation of the sheer mass of people and activity, I found the street scenes to be a lot less loud than I would have expected. Again, assuming the mass of people, I would have figured you’d hear much more yelling, honking of cars, noises of buses etc. I simply don’t find it to be that loud and what I’d expect of an over-flowing urban center. Also, reading what you do about the pollution in China, I actually didn’t find the pollution to be that noticeable or bothersome. Of course, I spent almost all of my time indoors, but the times I was outside during the day, the pollution didn’t make me uncomfortable. While it was certainly hazy, the continued actions such as cars being able to use the roads only on certain days look to me to be having a continued impact on the pollution. The airport in Beijing is world class—comparable to any in the US or Europe that I’ve been to. Driving was pretty organized, unlike India for certain. As a a matter of fact, there were even large signs on the highway advising drivers to stay a safe distance away from the vehicle in front of them. Additionally, left turns and yielding to pedestrians seemed to be done very thoughtfully. The one area where driving was a little less organized than the west was in the merging of lanes on the highway as traffic became a problem— gentle merges don’t seem to be the norm. Taxis and police cars seem to be using nice cars—Volkswagen Jettas for taxis and Volkswagen Passats and Elantras often for police cars. I didn’t notice any carpool lanes from the airport or on the way to the Great Wall, but possibly didn’t know what to look for. In this part of Beijing, people were very fashionable, wearing and carrying popular brand clothing and accessories. Walking around, you don’t see many overweight or obese people. Likewise, I didn’t notice many balding men. In an earlier blog posting, I wrote about the resurgence of the watch production industry in Karnataka, India and part of the explanation was due to increased fashion purchases of watches from Chinese consumers. Interestingly, I expected to see every person wearing watches, but felt it was a 50/50 mix, probably similar to other cultures. From a working perspective, in Beijing, it’s a very accepted practice to have quick naps after lunch. Workers I believe generally don’t have as much private space for their office workstation as they do in US companies. I noticed more smokers in China than what I’d see in the US. I had one meal at KFC, and it was clear that the portions offered at KFC in Beijing are smaller than the portions offered in the US. A potential indicator of the over-weight factors in the US. An interesting sight was on several occasions, I would see men walking with their short pulled up above their belly in public. Appeared to be an accepted practice probably related to the heat. At tourist sites, I’d often see Chinese tourists walk up to the front and cut in line but be forcefully told by another Chinese tourist in line to go to the back of the line. I saw some hi-rise buildings but not as high as I had seen in Hong Kong. In general, each unit would appear to have more space than the units in Hong Kong. In Hong Kong and places like India, you will always see clothes hanging outside of the windows of the units to dry. In Beijing, I did not see clothes hanging out, due to what I’m told, is the pollution and the dust and dirt that would get on the clothes while being hung outside. Lots of German and Japanese brand vehicles on the roads and in the parking lots—didn’t see many local Chinese brand vehicles or American brand vehicles. Often, social media websites would not be available. I was thrilled to see some outdoor table tennis tables in parks and community areas—don’t see that in the US. As we got further away from Beijing, I saw more people on bicycles and walking the streets. I saw some NBA jerseys on local Chinese—some Houston Rockets jerseys, a Steve Nash jersey, a Carmelo Anthony jersey, even a Ben Wallace Cleveland Cavaliers jersey (go figure!). At some of the outdoor fruit stands, peaches, plums and cantaloupe were featured fruits. One local fruit in China which is known as king of the fruits is the durian. A very stinky fruit, many Chinese love the taste of the fruit. I tried the fruit but wasn’t able to get past the smell and enjoy the taste, unfortunately. Driving along the roads, I didn’t see many buildings, signs, or statues of government leaders. One has this impression of Communist countries that pictures of leaders would be everywhere, but I feel I saw more statues and pictures of leaders in India than in Beijing. Surprising to me, there is a Tibetan goods store right near Tiananmen Square. Near Forbidden City, I saw a bicyclist apparently hit a woman pedestrian. The crowd went to check to see and help the woman first. In India, there would have been a confrontation right away with the crowd and the bicyclist which didn’t happen here. 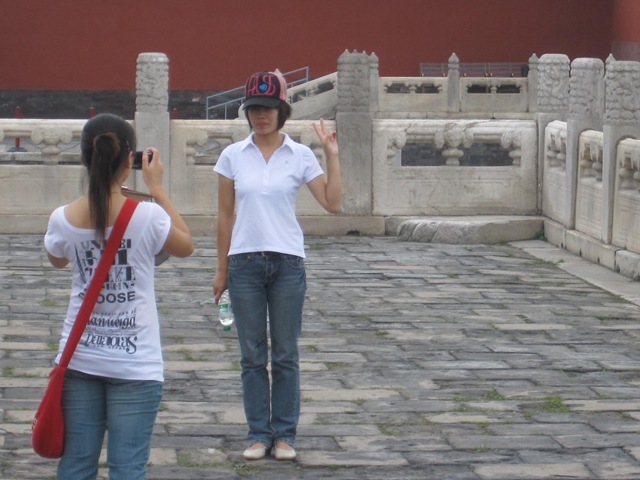 A couple of characteristics of Chinese tourists— 1) they often like to use the peace symbol when they are getting a picture taken with them and 2) they really like to pose in photos. I noticed that time and time again at Forbidden city. 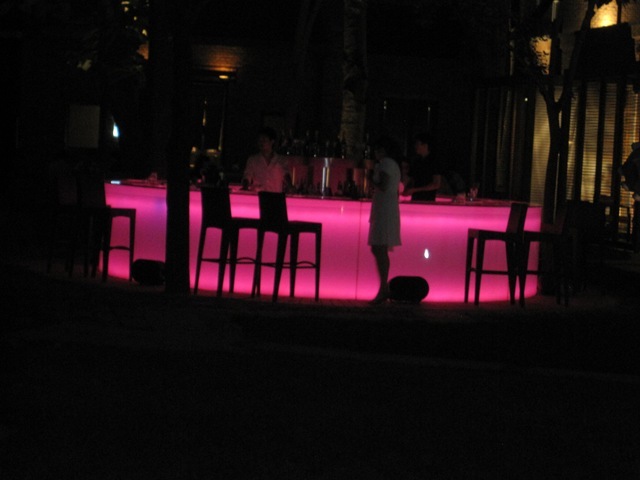 Club 1949 Hidden City—famous for Peking duck, nestled amongst big buildings is this restaurant/lounge. If a tea kettle is on the table—the spout shouldn’t point towards anyone on the table—that would be a sign of disrespect. At a restaurant, the Chinese raise their hands up very high and straight to get the attention of a waiter or waitress, unlike the US, where people will wait until the waitress is near their table or try to get eye contact with them and then waive them over. One can tap the table twice to say thank you to the waiter and also tap the table while water is being poured and then stop tapping when the level of water is enough. No words need to be uttered. Overall, a nice first visit to China which has wet the appettite for a more prolonged trip to China, to see both the rural along with the urban parts of China. interesting observations about people.. i liked it. thanks for giving me a virtual trip. Excellent travelogue about Beijing and surrounding areas. This is a “must” read for any one wanting to go to China. We were most impressed by the enormity of Tinaman square and went back to see it at night time. I hope that you get to go there again and explore the excavation site of the Terra Cotta solders as well as the river cruise. Aativas, SM, VijayV, and SG– thanks for visiting the blog and I’m glad you enjoyed my journal of Beijing. Next time to China, hope to see more of the country and be able to compare to what I experienced this time in Beijing. 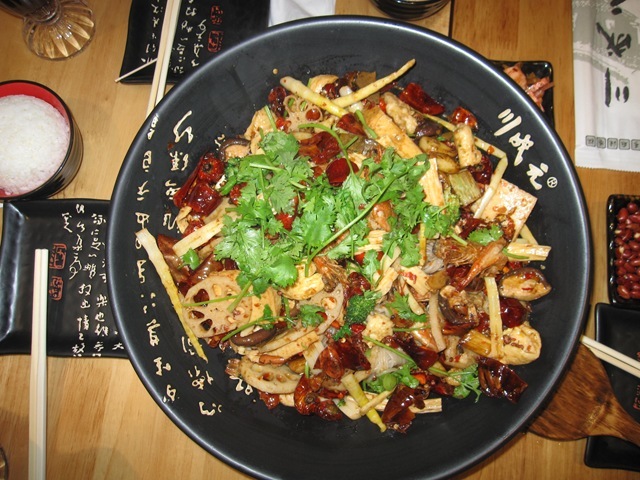 Bhavna auntie– thanks for visiting the blog and offering your comments and views of your trip to Beijing. Seems like we had some similar experiences. Yes- next time I’ll have to see the Terra Cotta soldiers and more of the smaller towns and villages of China to get a more complete picture. Interested to hear more about your travels throughout Asia. I see that you have developed a nice habit of recording your observations. You have a very good style of writing. I enjoyed reading your travelogue. I may not miss not having visited the great wall yet! May be in future you will be able to use such observations in a novel or travel book. The apparent differnce that you notice in the two developing countries of Asia is due to the different road to development adopted by them. Personally I prefer democracy of India but wonder how the ills, shortcomings and adverse effects of a democratic governance can be overcome to match with the efficiency of a communist/totalitarian governance. As you rightly observed it may require a deeper study to compare overall and long term effect of democratic governance with communist governance or between a centrally controlled economy and a free market driven economy. Thanks for the comment– writing a book with some pictures some day would be a great goal– would need more time to travel and explore in these places for that to happen. Definitely agree that the types of governments do certainly leave their marks on how progress has happened, in what form it has evolved, which priorities have been emphasized etc. Wish I could take a nap after lunch!